RadioShack dumps its webOS inventory? Palm's situation hasn't been all too cheery of late; especially when word quickly spread about how the company was looking for a potential buyer. At the same time, they were hoping to see sales of their line of webOS powered smartphones to begin blossoming and hopefully sway things for the better. As we've seen many retailers slash the prices of the various webOS devices, one of Palm's long time indirect partners made a stunning move that brings forth an ominous tone. 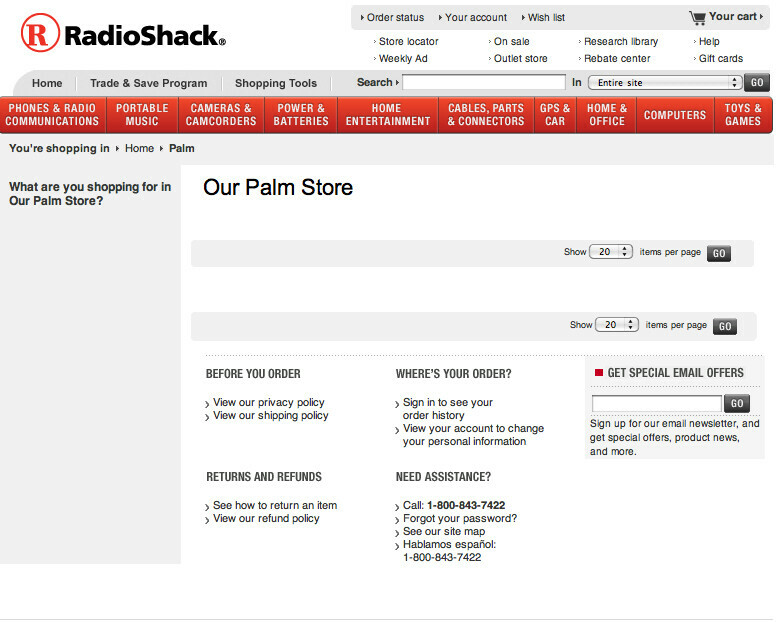 RadioShack was there at the beginning when the Palm Pre made its grand debut last summer, but recently the Palm Pre and Pixi have departed from the retailer's web site. Additionally, stores across the country are not going to receive any additional shipments of either handsets – so the current stock in stores are all that's left. In a similar move by other retailers, RadioShack chopped the prices of both handsets all the way to free as they attempt to clear out stock. Strangely enough, the retailer has something in common with Palm – they're also in the market of finding a buyer. Tough times have befallen these two great companies, but in Palm's case, this is just another hurdle that they will need to overcome.